In another bizarre coincidence unheard on the tour is that each elite surfer in Stop 8 on the WSL Championship Tour managed to catch the exact same number of lefts and rights. But that was on purpose and part of the wave pool format, which has been very hard to understand, but I think I finally have got it. In the men's event at the Surf Ranch Pro presented by Hurley, the 36 surfers were divided into two groups of 18, with each group only surfing on one of two qualifying days - Thursday or Friday. The women were divided into two groups of nine. The score of your best left and right would qualify you for the final (eight top qualifiers in the men, four for the women), with all 36 men and 18 women getting a third run on Saturday for a last chance to improve on either, or both, your scores. The inaugural wave pool event presided over a tightening of the title race. Three-time WSL Champion Moore got her first victory this season and her first since the Roxy Pro France last year, scooping 10,000 points and moving one place to 4th on the Jeep Leaderboard with two events to go. Stephanie Gilmore crept further ahead of Lakey Peterson on the leaderboard after finishing above her at Lemoore in second place. Medina takes home his second CT win of 2018, earning back-to-back wins after Tahiti. The 2014 WSL Champion narrowed the gap between him and Jeep Rankings Leader Filipe Toledo (BRA) with his 11th career CT win. For the two South Africans, it was an interesting weekend. Mikey February had trouble with consistency after the stellar video dropped on Facebook indicating some insane surfing in the leadup to the event. He finished joint 25th. Jordy Smith's massive alley oop on a righthander (see video) was impressive, and his 7.60 for the right (his first run) and 7.46 for the left (his third run) showed a nice balance, but it was not enough to make the final eight. He finished joint ninth. However, fractions in the score were the difference. Jordy's final qualifying score was 15.03 as opposed to Kolohe Andino on the same score but whose top wave (7.70) was a fraction more than Jordy's (7.60). Next up was Yago Dora on 15.07. The last two guys to make the final eight were Sebastian Zietz on 15.50 and Miguel Papo on 15.56. The Hawaiian dominated the Final Day from the start and posted two excellent scores on her first run to claim first place. Moore went on to improve her total with an incredible second run where she earned two excellent scores and a 17.80 total (out of a possible 20). It was Moore’s decimating forehand that proved to be the dominant factor for the win. Medina’s win today looked to be in jeopardy after an uncharacteristic fall on his opening left, but he was quick to bounce back and posted an excellent 8.73 on the right run. Medina then took advantage of a makeup left granted to competitors due to problems with wave quality and smashed a near-perfect 9.13 after an insane air. The current World No. 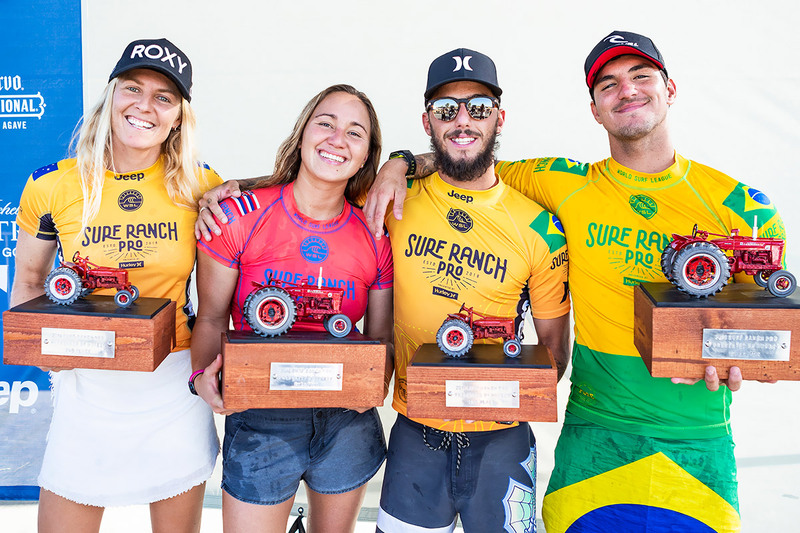 1 showcased his incredible aerial antics once more, landing three airs on the wave that earned him an all but perfect 9.80Toledo continues to be one of Surf Ranch’s most dynamic performers and one of the sport’s greatest showman. The current World No. 1 showcased his incredible aerial antics once more, landing three airs on the wave that earned him an all but perfect 9.80 (out of a possible 10). Now, the Brasilian heads into a crucial European leg with Medina only 3,100 points behind him. The men and women’s Word Title races heated up in Lemoore this weekend. Toledo’s impressive lead has been cut in half by Medina’s impeccable performance, while Gilmore managed to grow the deficit between her and Peterson. The "train machine" down the middle at Lemoore leaves the station roughly every four minutes, with each surfer riding a left and crossing over to get a right. Each two-wave run takes eight minutes. The first left runs at 9am on Day 1 (Thursday). Hiroto Ohhara (JPN) - a wild card - paddles for it and rides it and gets a score of 4.5. Now for the right. He crosses to the other side and gets a 5.5. He has now surfed the first of two qualifying runs allotted to him on Day 1. Next up is Kelly Slater, who catches his first left at 9.08am. He gets a mundane 4.6. He crosses over and rides the right for a 6.5. At 9.16am, eight minutes later, the next surfer, Miguel Pupo (BRA), hooks his left for a score of 5.1. Now he crosses and rides the right, for a score of 6.2. By the time each of the three surfers have done their two runs on Day 1 or 2, the next time they will surf will be on Day 3, the Saturday, for a last chance to better their two best scores.After Ohhara, Slater and Pupo have completed their first run, they surf in a duplicate format for their second run. Once Pupo is down with his second wave, Ohhara catches a left at 9.24am. He scores 1.9 for the left and 6 for the right. His previous score still stands for the left, but he has improved on his score for the right. Kelly surfs at 9.32am. He improves on his 4.6 on the left with a 6.1 and then smashes an 8.5. These are his two best scores so far. At 9.40am, it's Pupo's turn. By the time Pupo is done, its 9.48am and the next batch of three guys Wiggolly Dantas (BRA), Joan Duru (FRA) and Keanu Asing (HAW) are up. By the time each of these groups of three surfers have done their two runs on Day 1 or 2, the next time they will surf will be on Day 3, the Saturday, for a last chance to better their two best scores. This time they will just do one run, ie, one left and one right. As it turns out, for example, Kelly's two runs were on Thursday. He didn't surf on Friday. The two best waves from the four he rode in Run 1 and Run 2 was a 6.5 (left) and an 8.5 (right). On Saturday, he gets a 7.27 for his left in Run 3, an improvement on the 6.5, but doesn't better the 8.50. He qualifies for the last eight with these two highest scoring waves: 7.27 + 8.50 for a combined total of 15.77. For the final, the runs started from scratch, with three runs per finalist run at staggered intervals throughout the day yesterday. Got it? Good.